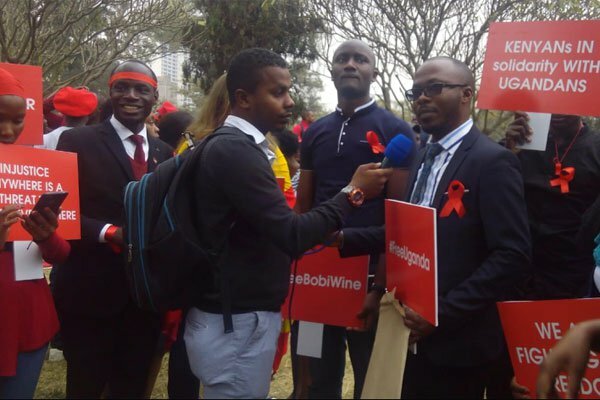 Kenyans joined to Ugandans in protesting against the brutal arrest and detention of MP Robert Kyagulangi commonly known as Bobi Wine who was to appear before the court martial on Thursday 23rd August 2018. These protests started on social media platforms especially twitter on which Kenyans advised Ugandans to stop being timid by letting the law enforcers bully them. Kenyans today brought the protests to the streets of Nairobi headed by The Law Society of Kenya, Amnesty International, Ugandans living in Kenya and student leaders who gathered at the Freedom Corner in Nairobi and marched to the Ugandan embassy on Riverside Drive. This happened at the same time as the court session by the court martial in Gulu where the state withdrew the charges against Bobi Wine on account that it is injustice for him to be charged in an army court and that he should be charged together with the other suspects in a civilian court. On being released, the protestors in Kenya changed their chants from “Free Bobi Wine” to “Free Uganda”. Bobi wine was however rearrested by police and taken to Gulu majesty court where he was remanded until 30th August 2018 when he will be appearing in court together with the others who were arrested.